The 2015 Champions Tour season ends this week, and, ironically, where Jack Nicklaus’ senior tour career got its start 25 years ago. The top 30 on the Champions Tour begin play Thursday in the Charles Schwab Cup Championship on the Cochise Course at Desert Mountain, the acclaimed community in North Scottsdale, Ariz., that features six Jack Nicklaus Signature Golf Courses. The Champions Tour’s season-long prize will be at stake on the Cochise Course, where the Golden Bear launched his senior career in 1990 with a win in The Tradition, a senior major championship. At the time, Nicklaus became just the third player in history to win a major in his senior debut. The Golden Bear went on to win a record eight senior majors to complement his record-setting total of 18 professional major championship victories on the regular tour. The tournament airs on Golf Channel tonight through Sunday from 4:30 p.m. to 6:30 p.m. ET. Nicklaus designed the Cochise Course, which opened in 1988—a year after his design of Renegade became the first layout at Desert Mountain to open for play. Desert Mountain has long been a favorite destination for the Champions Tour, and now, for the third time in four years, it will crown the season-long champion. The 30 players in the field have combined for a total of 121 PGA Tour victories and 114 Champions Tour wins. The 235-victory total includes 10 major championships on the PGA Tour and 24 major championships on the Champions Tour. Leading the field in Charles Schwab Cup points and No. 1 on the money list is Jeff Maggert, after a stellar year with four wins, including two major championships and more than $2 million in earnings. Maggert led the Charles Schwab Cup standings individually during the season and—in a Champions Tour first—was tied with No. 3 Colin Montgomerie heading into the SAS Championship played Oct. 8–11. Maggert is one of three players with a chance to claim the Charles Schwab Cup—the others being No. 2 Bernhard Langer and No. 3 Montgomerie. The German-born Langer, who won the Cup in 2010 and 2014, and who arrives at this week’s season-clincher with 12 top-10 finishes this year, could end the week as the first three-time winner of the Charles Schwab Cup. Closely following Langer is Montgomerie, who also has 12 top-10s this year. If Montgomerie wins, the native of Scotland would join Langer as only the second non-American to claim the Cup. 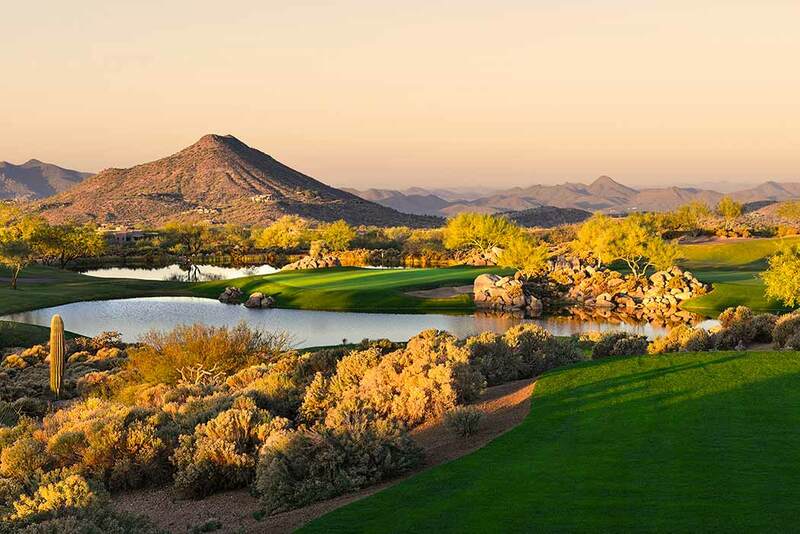 The Cochise Course at Desert Mountain promises to be a challenge for the top-30 in this week’s event, having hosted the Charles Schwab Cup Championship in 2012 and 2014. The Jack Nicklaus Signature Golf Course has also been a 15-time host of The Tradition, which the Golden Bear won a record four times. “This will be the third time in four years this season-ending championship has been played at Desert Mountain, and I think it is safe to say that it has been a success—not only for the Tour, but for the Desert Mountain membership and the Scottsdale community,” Nicklaus said. Nicklaus remains strongly engaged with Desert Mountain, making periodic visits there to guide the club on its long-range plans for each of the six layouts. It is that commitment which led the Charles Schwab Cup Championship to make its way to Desert Mountain. The collection of six Jack Nicklaus Signature Golf Courses at one facility is more than any other location in the 39 states and 41 countries with Nicklaus Design layouts. The Golden Bear’s Desert Mountain legacy began with the design of the Renegade Course in 1987, followed by Cochise (1988), Geronimo (1989), Apache (1996), Chiricahua (1999) and Outlaw (2003). His Cochise layout has ranked in Golf Digest’s list of America’s 100 Greatest Golf Courses and Golfweek’s Best Residential Courses list. It is regarded as one of the top layouts in Arizona. Below are the top-30 players on the Champions Tour money list who will compete in this week’s Charles Schwab Cup Championship.